Outdated software is a potential risk for your computer since hackers can take advantage of unpatched vulnerabilities. Hackers love to exploit old software, as it’s the weakest link in most people’s security. That’s why regular software updates are fundamental to your PC’s security. 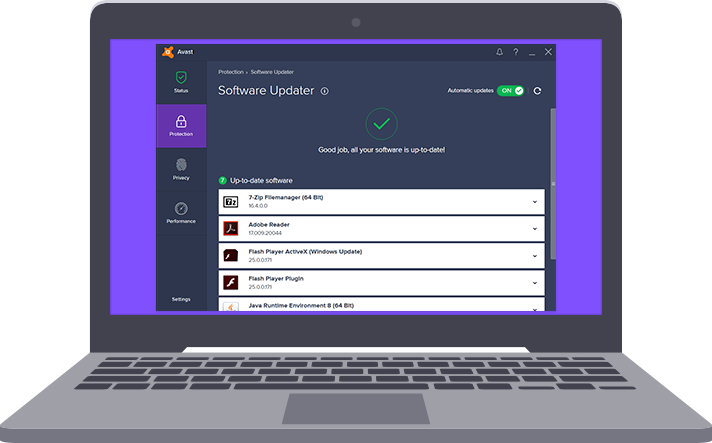 Avast makes updating software a breeze and helps you avoid installing any unwanted software. How can hackers harm my PC? Outdated software lacks the most current security measures and patches, leaving you vulnerable to hackers who know how to exploit these weak spots. To ensure that you’re fully protected, you need to update your software regularly. All Avast security products for home PCs let you update your software with a single click. Premier users don’t even need to do that, as software updates automatically in the background. Do you use Avast? 400 million people all around the world do. If you are one of them, but aren’t using Avast Premier, no worries - you can update your software with one click. Open your Avast and click on ‘Protection’, and there’s your ‘Software Updater’ icon.